The all-new Pattern Explorer. Sit back and relax while the Explorer makes all kinds of new patterns for you. Go on autopilot for inspiration, to learn what’s possible, or to refine a pattern design idea. Keep one or more parameters fixed while exploring the others. Stop any time you find something interesting. Your Explorer history is recorded. Replay it like a movie or browse frame by frame and select the best. Learn more here on this blog or in the user guide. Dozens of new blend modes. 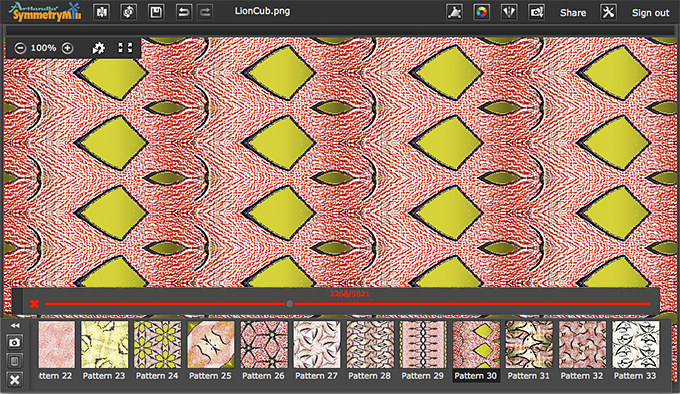 Easily create seamless patterns by meshing together even the hardest parts of a source image. The new blend technology smooths away boundaries between neighboring units exactly to your liking. Choose among the Normal, Enhanced Average, Dissolve, Darken, Multiply, Color Burn, Inverse Color Dodge, and many other blend modes. Examples of Normal, Dissolve, Soft Color Burn, and Soft Color Dodge blending (from left to right). A battery of new filters. 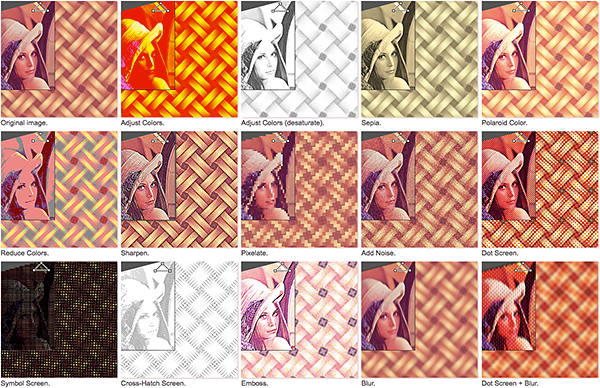 Tweak your patterns with a rich new collection of non-destructive source image filters, including Sepia, Reduce Colors, Pixelate, Add Noise, Dot Screen, Emboss, and others. Applying filters to tweak your patterns. The new repeat size display. SymmetryMill now automatically displays the repeat size as you edit the control path—or simply hover your mouse over the control path. This lets you quickly make the repeat size of your patterns exactly to spec. The new keyboard shortcuts. 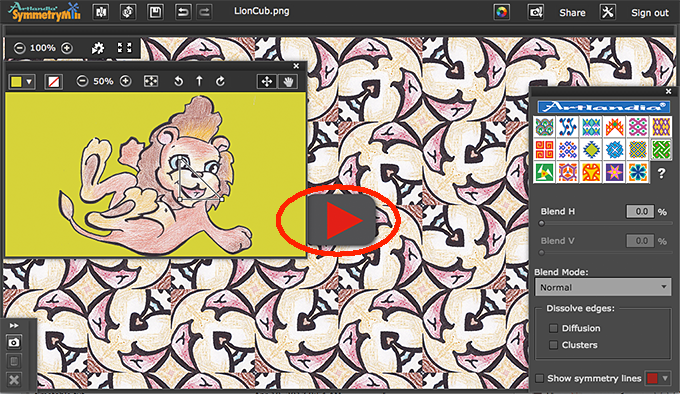 As a great example, Cmnd-S (Mac OS) or Ctrl-S (Windows) will now automatically re-save whatever image file you exported the last time—the whole pattern or a tile—while Cmnd-Shift-S (or Ctrl-Shift-S) will open the Export dialog and let you choose the export format and Cmnd-1 (Ctrl-1), Cmnd-2 (Ctrl-2), … will reload the respective images from the File > Load Recent menu. Larger pattern thumbnails give a better preview of shared patterns. A Pattern Central listing for the pattern Cafe Terrace at Night from the Infinite van Gogh series. 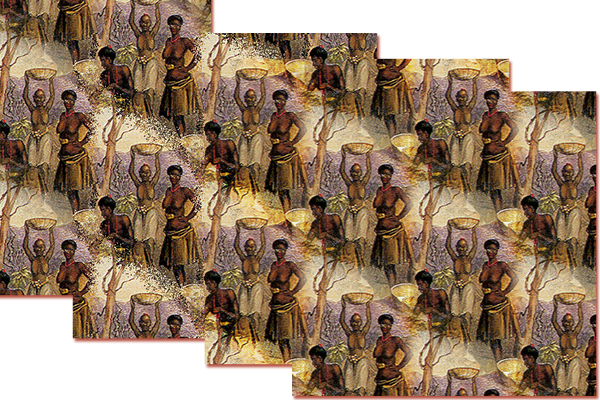 Direct Links to pattern tiles let you use free shared patterns in your fabric printing or other projects, including webpage design, with minimal effort. 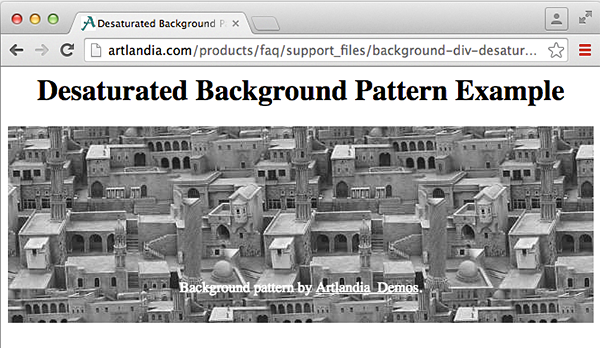 An example of using a desaturated pattern from Pattern Central on a webpage. We hope you enjoy the new SymmetryMill 2! See the Artlandia website to learn more.